We have published several video tests to the 'You Tube' web site to explore the feasibility and utility of this medium as a means of delivering portfolio sample material. The samples are of only modest visual quality when compared to the original master footage. This appears to be due to both the internet medium itself as well as our inexperience with the conversion process used to publish the footage to the web. Having been away on a trip to the East Coast, the Magical Light Photography team was anxious to return to the Yosemite Great Horned Owl Family. Thus, on June 24th we made our way to the nesting tree and were surprised to see the nesting cavity now lying on the ground! Whether from age, decay, wind (or a combination of the three,) the tree had cracked in two perhaps eight feet below the nest opening. After weeks of speculation we can now confirm that the Great Horned Owl mating pair delivered a clutch of three owlets* nearly two months ago. 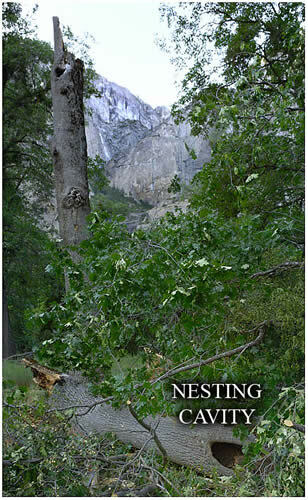 Alas, Yosemite Park Rangers and locals believe that two of the three were killed by predators shortly after fledging. After proving elusive for nearly three weeks, our cameras again captured the Yosemite Great Horned Owl perched in his (or her) oak tree cavity (see arrow.) 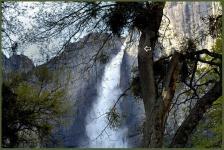 The photo presents a sense of "place," defining the homestead relative to its proximity to Upper Yosemite Falls. During the period since our last encounter the owl's distinctive hoot has been heard several times in the nearby forest but we were unable to make visual contact.